From the Warp: Do you waffle on color schemes like I do? Do you waffle on color schemes like I do? For as simple a model as this guy is, I really like how he came out. Sure, my army is Deathwing and this guy is a Howling Griffon, but it's deciding on a particular color scheme that is giving me the most trouble. I can't be the only one who goes back and forth between color schemes trying to decide which one to go with. I figure I've got it easy too, I'm working with official background colors schemes and not making up my own. I can't imagine this process if I were trying to create a color scheme from scratch like some folks do with DIY armies. When it comes to my Deathwing, I really do like both schemes. And I'm not looking to turn this post into one of those "what should I do" posts. I'm more curious to see how you all decide your color schemes. I guess for some folks, it's fairly straight forward. You know, Orks are green. But even then, you have different shades and then there is the task of picking which clan you want to go with. Now that I think about it, all the armies have choices you need to make. Even bugs need a color scheme. That didn't help my point. I love the background of the Dark Angels and the idea of the Deathwing. I think I find their history before they were universally known as the "Deathwing" to be a bit more interesting though. They were the same guys doing the same work... just without the fame. I worked through how I would do it if I were to paint them black and I've worked through the bone scheme as well, but I'm still left trying to decide at what point in the chapter's history I should settle on. I know that picking a particular scheme will bring all the associated baggage with it, but I don't know if I'm worried about that as much as I am creating something unique and cool looking. I'd say the main purpose is to create a good looking army over an effective tabletop force. I plan on building it so I can play games with it, but I'd like to be more of a conversation piece than anything else. Maybe I'm doomed in my hunt because I don't plan on doing a ton of conversion work to the army. I'd like to keep it simple if at all possible. Of course that means the painting is going to have to carry the army if I don't use my conversion work to help me. So what's the trick to picking a scheme? Am I crazy for trying to find a spot in the official background to plant my army? I know others have done it. I'm just curious to know how you all settled on your final color scheme, especially if you had more than one you really liked and had to choose between them. oh definately. I don't have a lot of time to paint and i took ages to settle on a Marine Chapter i wanted to invest the time (and figures) in painting. I think some of my AoBR guys are on their fourth scheme now, and starting to show it. and then even when i settled on the Blood Ravens i spent ages staring at a dreadnaught wondering where to put all the colour changes...maybe i'm just indecisive? I'm the same way... I never wanted to do a "Blood Angels" or "Ultramarines" chapter as that would cause issues with what I can use the army as. Also one thing that gets me is how many people do a particular army. My Blood Angels are Knights of the Blood to look different on the table to every other red army. I followed your original bone guide for my Deathwing as well as it is darker and dirty than the most out there. But as your looking at a particular time frame for your Deathwing. How about I throw a spanner in the works. As you have noted there is the original Black armour and the current Bone armour. If you remember the original story of the Bone army it was done by hand by the remainders of a squad that survived on a Space Hulk. They did it by hand so it was Bone over Black in a tribal style. you could use some weathering technique to show the chips of black armour showing under the bone through wear and tear as well as it all would look different per member of the army like you would see with any Tribal culture. I don't think you're alone in this Ron. Even if you have an established scheme it can difficult to choose how to paint the details. Example: What if a sergeant is wearing cloth, what colour do you paint that? Do you paint the trim of his shoulder pads a different colour? Things like that. I think I'm going to make up a successor chapter for my Deathwing as I'm not a fan of the full bone scheme. The lighter schemes just don't pull of the dark brooding vibe I'm going for. 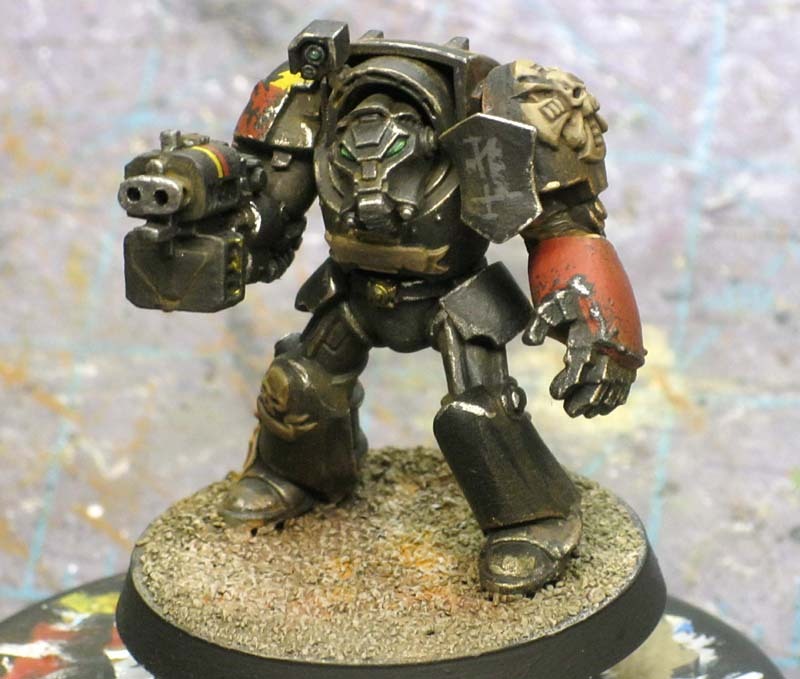 I was tempted by pre-heresy but to really do that justice I'd need the different armour style. So successor chapter it is. I am a shameless waffler. Even if I've worked out a scheme - which I usually do for any army I end up sticking with and actually painting - I'll waffle over technique and end up with countless slight variations. It's one of the reasons why I don't like army-looking armies, if that makes sense - I prefer forces where variation doesn't seem out of place. One less reason to angst over 'doing it wrong' - the only thing I have to worry about is whether it looks good or not. I've painted several armies in my gaming life and specialize in choosing color schemes. There are some choices you have to contend with. Will you use your own colors or existing chapter colors? Will there be heavy converting or mild? What super details will there be? If you choose an existing chapter color scheme with few conversions then you have to paint that color scheme better than anyone else. That's tough for anyone. You will need to add lots of details like weathering, multiple layers of highlighting on even the basic models, and probably lots of hand painted details and iconography. You can see my painted armies at my website: www.omegahobbies.com. I had a difficult time picking mine. I love the fluff on the Raven Guard, but I didn't feel like painting 18 shades of black. So I created a successor chapter (logo is my icon over on the left there). I finally settled on a background where the chapter excels at stealth and night attack. so right there I decided on a darker midnight-ish scheme. I started thinking about shadows and the color of dusk. Since shadows are never absolute black, I waffled between purple and deep blue for colors. I finally settled on a darker purple (Beaten Purple from P3) and broke out my color wheel to see what the best contrasting colors would be. turns out that the golden and green areas would be the best contrast. so I went with gold highlights and green accessories/eyes (kept the weapons black though, honoring the parent chapter). It seems to have worked out pretty well. For my first iteration of my Space Marines, I had a single terminator that came with an issue of White Dwarf. I painted it in a way I thought was cool. My favorite color is red, and I used black to break it up. Over time, I learned to hate that because (among other reasons) everyone thought I was playing Blood Angels or Chaos. I got to juuuust about my last unit (well over 2000 points) and said "Nah, I'm gonna play a Deathwing/DA army now." For any new color schemes, I tend to look at kid's toys. Think about it. Here are things that were designed by people that are pros at catching kids' eyes and making them say "ooh! I want that!" So hit up Toys R Us and walk around a bit. Yes, even the girl's toys. You'd be surprised what you can find there. Another Waffler here. I love both Alpha Legion and Iron Warriors. I waffled for a long time deciding on a Chaos Space Marine theme and scheme. In the end, I decided on both, using IW as the primary scheme but working on some AL to represent my Chosen. @JustPlainJim: I like the toy store idea. I will use that when (if) I get around to painting my Dark Eldar. I am very easily distracted, so I can sympathise. 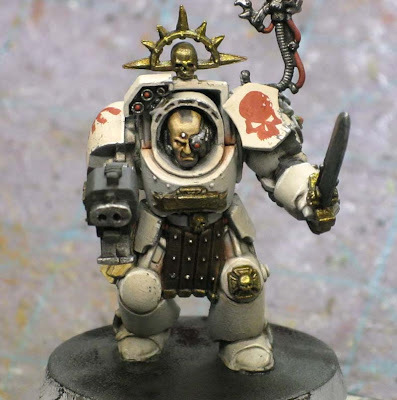 I don't know if Deathwing ever did this, because they're kind of an alternate colour scheme already, but have you considered painting some of your guys in an old RT camo-scheme? To represent a past campaign? This is so coll to see that other people go through the same thing as me. Not that I want to see everyone else struggle, but it's comforting to know that I'm not the only one who obsesses over this kind of thing. Lord Shaper: That's a very cool idea, it would place the army at a very specific time period too. Although it might be tough to pull off on an army. One or two models might look cool, but a whole force might be too much I worry. Mr. Esty: Haven't given that one much thought. I see the different schemes in the old Compendium book and could pick one out I suspect. Now that would be a completely different look wouldn't it. You don't see much if any camo on Marines any more. I had two or three attempts at painting my IG army, until I saw a Vendetta on a forum somewhere based black with codex grey specks across the hull, and red trim. I was sold. I dove head first into that color scheme and never looked back. With that experience behind me, I'm hesitant on deciding a color scheme for my Blood Angels, because I haven't had that 'awesome' moment when I see a scheme. I'm closing in on bone armor with scab red/bleached bone quartering details(shoulder pads, knee pads, etc), as I'd like them to have some Knightly heraldry as well. I think it is an alright color scheme, but not 'AWESOME' like my IG. However, my IG are so dark that I usually get medicore painting scores at best because they don't stand out. Meh.